I’ve owned and used a number of dive computers over the years. The most recent of these was the Subgear XP10, I bought a couple years ago as a simple Nitrox computer for sport dives. Before that, I had an old Oceanic Datamax Sport for that type of diving. For technical diving, I’d been using an old VR3, and occasionally a Vytec. The VR3 was great for it’s day, but the software always sucked, and the way they lock them at the factory blows. The Vytec never really was a full-fledged technical decompression diving computer in my view, even though it does support gas switches. Since my XP10 crapped out on me, and none of my computers were really ideal for the range of diving do anyway, I knew it was time for a switch, but was on the fence about what computer to switch to. As a side note, for the last 18 months or so, I’ve doing all my technical dives on tables generated using GAP decompression software. My primary timing device/depth gauge has been the Scubapro Digital 330m Depth Gauge backed up with any other dive computer in gauge mode. I had been looking at the Shearwater Petrel since it came out last year. Prior to that, I had planned to buy the Shearwater Predator. I hadn’t made the leap because my deep dives have been more like exercises in precise time and depth management than sightseeing anyway. Even with the computer, I plan very strictly based on the tables I generate using GAP. But, being an instructor, I do tons of NDL dives using simple computer profiles, as well as lots of sport dives in general. I basically had it with all of my crappy old computers, and when my Subgear XP10 wouldn’t turn on last week, that was it. 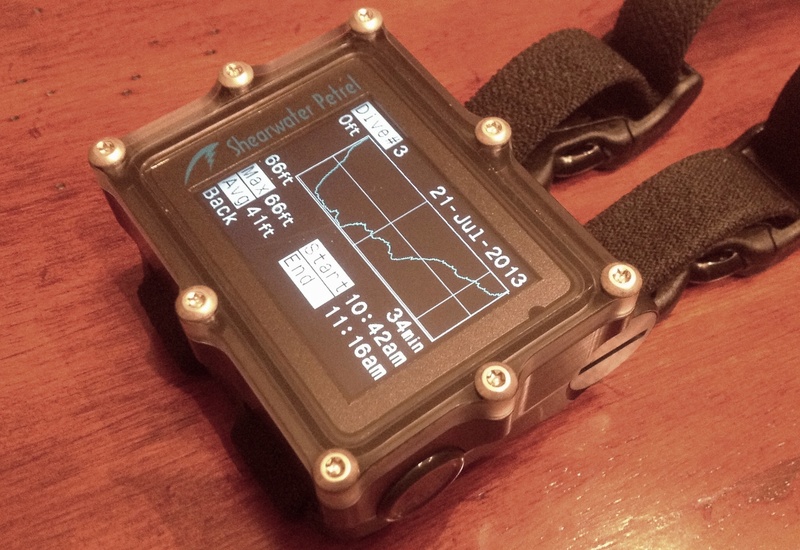 The Shearwater Petrel is a technical decompression diving computer in the truest sense. The diver has full control over gradient factors, a choice of decompression algorithms (standard is Bühlmann ZHL-16C), support for 5 breathing gases, customizable views, and of course, out of the box support for closed circuit diving. My initial dives with the Petral have been no-deco dives, but the view is pretty obvious about what’s happening during the dive whether you have a ceiling or not. Basically, the bottom row of the screen shows your NDL or the depth/duration of your next required stop, plus minimum time required to reach the surface. I should probably note that I am diving open circuit. The computer also displays your current gas. Changing gases is done by pressing the left button and toggling to your selected gas. Press the right button to make the switch. Gas switching on some computers in miserable. The Vytec is one of them. The main thing I like about the Shearwater Petrel is that everything you do with it is contextual. If you need to change gases, that process has been made as simple as possible based on where you are in the menu system. Diving in general, all the critical details are available at a glance, yet if you need more detail, it is almost always a single right button press away. I will, of course, form a more comprehensive opinion once I’ve had a chance to really dive with the Petrel. But, I think, having been in the water with it for a couple repetitive dives, I have a good sense of how it will perform in more demanding circumstances. So far, the Shearwater Petrel is the best computer I’ve ever dived with. It is easy to read and comprehend, as well as easy to use underwater. Being fully customizable, there’s nothing I find that makes me question it’s suitability for serious technical diving. I’ll follow up with more detail once I’ve had a chance to do some deco dives with it. This entry was posted in New Dive Gear, SCUBA Gear Reviews, Technical Diving and tagged dive computer, diving equipment, diving safety, nitrox, shearwater petrel, tec gear, tech gear, technical diving, xp10. So, how did you get your Shearwater Desktop Dive Log into Divelogs online software? Well, even though I do keep the Shearwater Desktop Dive Log software up to date, I really prefer Subsurface, which is a platform independent, open source project originated by Linux creator, Linus Torvalds. I like Subsurface for a lot of reasons. It is capable of storing a lot more information, directly imports dive data over Bluetooth from the Petrel, and has a one-click upload to divelogs.de. If you haven’t checked it out, it might be worth a look. It is incredibly powerful, and the developers are very active, with a new release apparently due out very soon. Serious decompression dive planning seems to be maturing to a point where Subsurface could soon replace Gap, which is my only reason for keeping one sucky Windows computer around. If you do try it out, let me know what you think. The Subsurface program is not allowing the dive log to download from the petrel to the MAC computer. I select the correct DC from the drop down menu but it will not download. When I download the logs from the DC onto the MAC into the Shearwater dive log software, it works perfectly. Stumped. Sorry, my response was a little slow. I had an issue with my Bluetooth driver bombing out after updating to Mavericks. Check to make sure Bluetooth is actually working. I suspect it is. Let me know if you get any errors, and even send me a screenshot if you can (PM: joe@joescuba.com). Without something to go on, I really can’t begin to guess what might be going on. You are linking to hohndel.org – should be subsurface.hohndel.org. As for the downloading issue. There are a few oddities with the way libdivecomputer uses the Bluetooth stack. Sometimes it takes a couple of tries. If you still can’t get this to work, please report a bug at our bug tracker trac.hohndel.org so we can help you directly. How embarrassing! I corrected the link (and removed the nofollow attribute I didn’t realize was there). BTW, I recognize the incredible amount of work you and some others have been putting into Subsurface, and really appreciate it. It is, by far, the best dive logging program available and keeps getting better. I’m not sure how I can contribute, but I am a true evangelist. Thank you! I just completed my first two dives with my new Petrel. Your review was spot-on. Temperature is not displayed on the unit during the dive. Temperature information is available upon uploading the dive log from the Petrel and downloading the log on to a computer loaded with the Shearwater Desktop software. With a newer MacBook Pro, you just hold the Petrel in uploading mode close to the laptop and select “Download Dive Log” from the menu bar. The Dive Log allows you to write plenty of notes and provides the dive profile in graphic form. You can sync the dive numbers in your computer with your log. For those of us who relish recording dive objectives, plans, and logs, this is an easy way to get the dive log info off the dive computer and onto your landlubber computer. When using the Petrel for recreational diving, it does not give you a safety stop ceiling or countdown, correct? I am just transitioning into deco diving and planning on adding a deco gas so I am looking to move away from my Vytec for reasons you point out. Right. The Petrel doesn’t have a safety stop timer as such. For most divers, by the time they start thinking about staged decompression, remembering safety stops and safety stop times really isn’t an issue. The Petrel is a true decompression computer, so the focus is on required stops and meeting the demands of technical diving. I can’t speak for Shearwater, but my guess is sport diving conveniences were never seriously considered, simply because the technical diving community takes such a different approach to dive planning.